Well, that's it. Maingear's ultra-thin Pulse 17 has sealed my fate — I am completely ruined for thicker gaming laptops. There was a time when the size of a gaming notebook didn't matter so much. Three or four years ago a portable gaming rig that was nearly two inches thick and weighed close to ten pounds was an impressive thing. Pull one of those beasts out at a crowded coffee house and the other customers knew you weren't about to pull up a spreadsheet. Those meaty machines of old were never really about portability though. They were glorified all-in-ones, built to sit on a desk and stay there. They were loud, arrogant creatures that ate batteries in an hour flat, portable enough to slip into a backpack, but not enough to be carried about town for hours at a time. Then came Razer's Blade laptop, a magnificent black aluminium machine weighing under seven pounds and standing only .88 inches tall when closed. It wasn't the most powerful laptop on the market, but it was the most portable 17-inch gaming laptop on the market. Though system spec afficianados scoffed, the Blade sold incredibly well, encouraging companies like Maingear to give sleek and slender gaming machines a try, first with the smaller, more subdued Pulse 14 and then the bigger and better Pulse 17. Late last year, Maingear lent me a shiny new Pulse 17 to play with, and here we are. The Pulse 17 is an incredibly skinny PC gaming laptop. Maingear packs as much hardware as they can into the machine's slender frame without anything catching on fire, and then pass the savings on to you. Here's the system I tried out. Dimensions: (W)16.47" x (H)0.85" x (D)11.29"
For starters, I watch a whole lot of Netflix and Amazon Instant video. My review Pulse 17 arrived in early December of last year (yes, I am slow), just before us remote Kotaku writers took our annual pilgrimage to Gawker's New York City headquarters for our Holiday party, so I brought it along as my work laptop. While everyone else in the office banged away on their iMacs, I was happily tapping out stories on my large fuschia laptop. Back at the hotel I'd go wild, watching old episodes of Law & Order in-between trips down the hallway for complementary hot chocolate. Since then, I've also been gaming on it. I figured it's only fair. I've played through BioShock Infinite, Tomb Raider, Assassin's Creed IV: Black Flag, Batman: Arkham Origins, Call of Duty: Ghosts, Metro: Last Light and any number of smaller Steam titles. I also used it to play SimCity for my end-of-year review refresh. 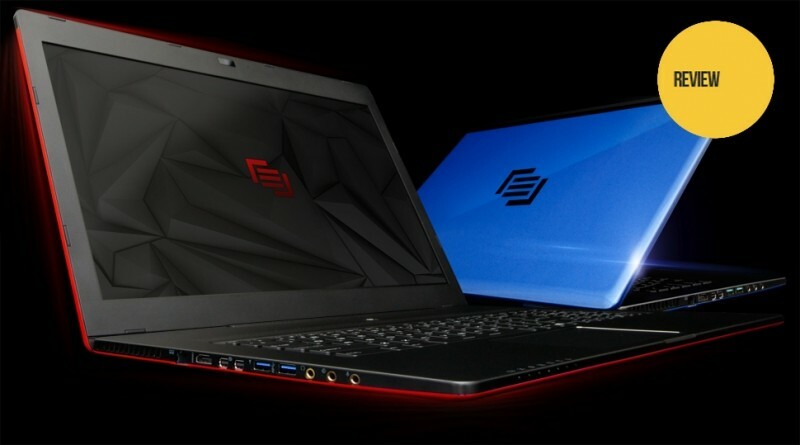 Portability: I had performance up at the top of the "What I Liked" list originally, but then I realized that this new wave of skinny gaming laptops have completely changed my priorities when it comes to portable computing. I used to worry primarily about specs, but now I am more concerned with how comfortable it'll be lugging it about in a backpack at the airport. The Pulse 17 is very comfortable. In fact it's hard to believe a unit that unfolds into something so imposing can slip inside a moderately-sized bag and basically disappear. Every time I pulled it out of the bag I bought for it (yes, I bought a bag for a review unit — none of my others would fit 17 inches) it was a delightful surprise. Hey, there's a pretty awesome laptop in here. Nice! Performance: That's not to say performance isn't important, of course. A gaming laptop has to run the latest games — not as good as a similarly priced desktop gaming rigs, but well enough that you don't find yourself yearning for one. The Pulse 17 does a fair job of it — a fine job when taking its form factor into consideration. Running BioShock Infinite on Ultra settings with all the DX11 bells and whistles turned up nets an average frame rate in the mid 30s — not the 60 frames-per-second that's all the rage right now, but certainly playable. Drop the settings down to High, and the frame rate jumps up to 50. Take them to Medium and I don't know, because my pride will not let me run a game on Medium settings. It's the same story with games like Tomb Raider and Assassin's Creed IV: Black Flag. With everything turned up to 11, the frame rate lingers in the 30s. Sacrifice some detail and your 60FPS sweet spot is surely within reach. There are other gaming laptops that perform better. They are a lot heavier and bulkier than this one. Profile: I was going to call this section design/engineering, but it didn't start with "P" and I had a good thing going here. Either way, the Pulse 17 does cut a striking profile, thanks to its excellent design and engineering. There, made it work. It can't be easy, cramming high-quality gaming laptop components into such a slender space while making sure they don't catch on fire, but here we are, two months into the Pulse 17 and I have not had my apartment engulfed in flame. Perhaps its due to the system's metal and alloy construction, but it didn't get nearly as hot as I thought it would while running a demanding game. The top side near the display got a bit toasty, but for the most part I could keep the system in my clothed lap without much discomfort. The top half of the unit is all brilliant display, perhaps not as bright as i would like it, but lovely and clear and capable. That leaves a lot of space on the bottom half, allowing for a full keyboard, a substantial trackpad (which I hate less than every other trackpad I've used), and plenty of space for my giant hands to rest. In short, function and form are getting it on up in this box. It may largely be MSI's function and form, but it's still all steamy. Paint Job: The defining factor of a Maingear system is the paint job. It's what sets a Maingear system apart from other hardware makers that use similar cases and components. As with the F131 desktop I reviewed back in 2012, the Pulse 17 review unit I played with here came with a lovely coat of Glasurit paint — Furious Fuschia, to be exact — the same sort of paint used for Porsche and BMW vehicles. It's sparkly and extravagant, applied by expert hands using expensive equipment. My system was actually delayed in shipping because they hadn't gotten the paint job exactly right — that's how seriously they take decorating these things. I am going to miss seeing its big-old pinkish-profile on my desk. Audio, Which Doesn't Start With P, Dammit: Sound this good should not come out of something this small. With a pair of speakers powered by Soundblaster Cinema, the Pulse 17 can easily double as a portable entertainment device in a crowded room. While tooling around with games and movies in my hotel room in New York, I actually found myself turning the sound down, worried I might be bothering the adjacent rooms. That never happens with a laptop. The Keyboard. Well, the Space Bar: For the most part I really love the keyboard on the Pulse 17. It's got that whole multi-color illumination going on, and the flat, nearly-flush keys I've been in love with since the original Razer Blade came out. It's just the one long key at the bottom I have an issue with. My fingers just did not want to make the space bar on this system work. If I was concentrating on delivering a little extra force, sure, but the last thing I am doing when working on a story is concentrating on my typing. Case Design: The overall aesthetic is quite pleasing, but I did have a few issues with the Pulse 17's laptop enclosure. Firstly, the unit doesn't shut flush. It snaps closed, to an extent, but there's space between the top and bottom halves that allows for some wobble in transit. Secondly, and this might be completely stupid, but the black strip atop the unit feels like it's in the wrong place. I look at this, and I think "Well, that black bit is obviously the hinge." It is not, and it gets me every time. I've been using this system for over two months now, and I keep trying to open it the wrong way. Were I to purchase one of these for myself, I'd have Maingear laser etch opening instructions on top. The Maingear Pulse 17 is the straw that broke the camel's ridiculously fragile back (it's so light, stupid camel). It's proof that the appeal of Razer's Blade line wasn't some fluke. There is a time to favor portability over power, and that time, for me, is now. Maingear's entry into the market is a remarkable little PC entertainment machine, and while its power and slender frame are matched by similar systems on the market, Maingear's customization options and customer service give it a definite edge on the competition. Before you could have a thin, powerful gaming laptop. Now you can have your thin, powerful gaming laptop. Maingear's Pulse 17 is now on sale at Maingear's online store. Configurations start at $2,099.